Running in an exerted state may increase a runner’s risk of overuse injury if the muscle loses some shock-absorbing ability or if a change in movement pattern occurs. Since overuse injuries are considered the result of exposure to repetitive stresses, researchers often assess running mechanics during the course of a single running bout. 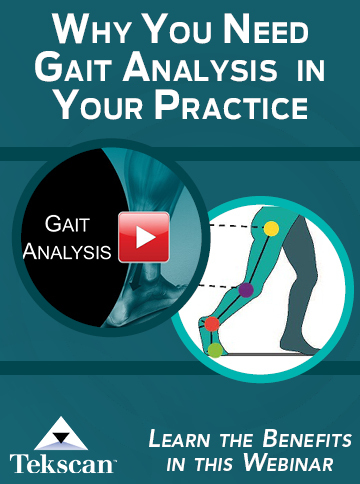 Typically, the goal is to fatigue a runner and examine changes in lower extremity mechanics. However, there are several challenges when studying fatigue, including how it is defined and measured. Task-dependent fatigue is related only to the characteristics of the exercise or task inducing the fatigue. Some studies use an exercise protocol designed to bring runners to the point of exhaustion or maximum fatigue. 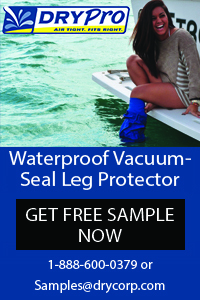 This could allow investigators to examine the greatest changes in biomechanics that occur as a result of exertion. However, many different exhaustion or maximum fatigue protocols have been used, and not all studies use objective, physiologically measured criteria for fatigue or exhaustion. Different running durations and intensities may affect runners differently.25 The shorter methods exhaust runners faster, yet may fatigue their cardiovascular system before compromising the neuromuscular system. The physiological and kinematic responses to this type of protocol have been reported to be different than responses to a longer protocol, such as a marathon run.25 Additionally, while training, runners rarely run to the point of exhaustion or maximum fatigue. Therefore, designing a study with a protocol that resembles a typical running session may give a more accurate picture of the biomechanical changes that occur during running. Runners with the most common running injury, PFP, often do not have pain at the beginning of a run, but complain of a gradual onset of pain as the run progresses.27 This may indicate that prolonged running or exertion could cause changes in mechanics that contribute to PFP. However, there have been very few studies investigating the effects of exertion on running mechanics in healthy and injured runners. Comparisons among the studies that have been completed in this field are difficult due to differences in exercise protocols, which have included a marathon run,30 a treadmill run at typical running speed,26 a shorter run at maximal effort,31 running until exhaustion at the ventilatory threshold,25 and other variations. Many studies that examine running in a natural environment utilize 2D data collection and report only changes in sagittal plane mechanics,30 though running injury is often related to frontal and transverse plane mechanics. Despite the discrepancies, there is some evidence in the literature and from a recent study in our lab29 suggesting that running in an exerted state may elicit mechanics that could contribute to running injury risk. Figure 1. INV = inversion, EVR = eversion. Reprinted with permission from reference 29. Knee flexion at heel strike has been commonly studied after an exhausting run due to its role in shock attenuation. 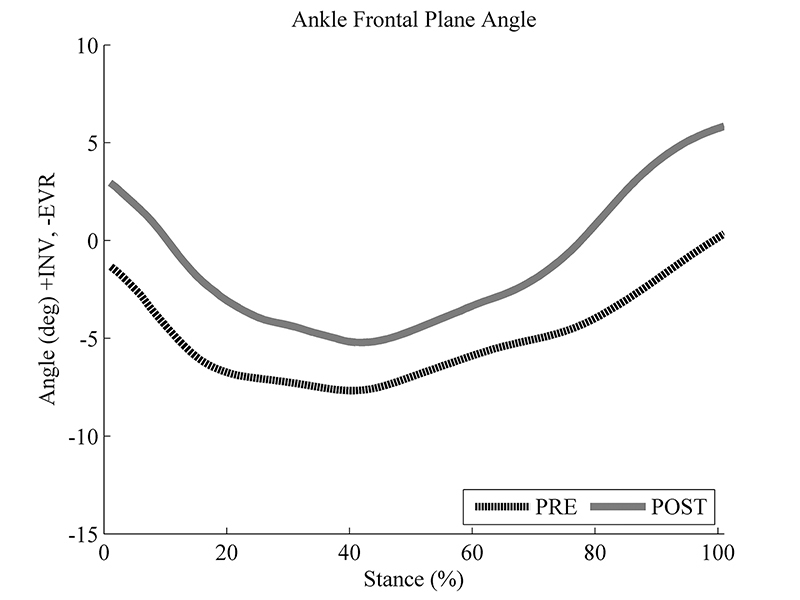 A few studies have reported no significant differences between pre- and postexercise knee flexion angle at heel strike,36-38 while others have reported an increase with fatigue in knee flexion angle at heel strike after a run.31,39,40 And, despite some evidence of an effect on sagittal plane knee angle at heel strike, this has not been seen throughout stance. 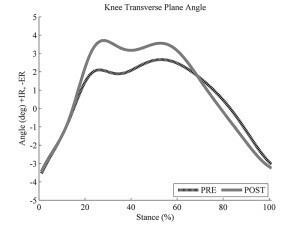 Peak knee flexion angle during stance has been reported to decrease30 and increase,31 while some studies, including our recent publication, have reported no significant change.25-27,29 These equivocal results suggest a typical training run results in limited changes in knee flexion. Figure 2. IR = internal rotation, ER = external rotation. Reprinted with permission from reference 29. In general, the observed changes in rearfoot eversion and transverse plane mechanics at the ankle, knee, and hip suggest that runners may be in a more risky posture at the end of their typical training run than at the beginning. Other effects of a run in an exerted state have been identified with regard to knee frontal plane mechanics. Focusing only on kinematic changes, Dierks et al showed that runners had decreased maximum knee adduction during stance, but a greater knee adduction excursion at the beginning of a typical training run compared with its completion.27 In contrast, our results showed a greater knee adduction angle throughout stance phase and a decrease in knee abduction moment when running in an exerted state (Figure 5).29 The frontal plane knee mechanics we observed may indicate that the healthy individuals in our study adopted this posture as a protection against potential knee pain. Figure 3. IR = internal rotation, ER = external rotation. Reprinted with permission from reference 29. Figure 4. IR = internal rotation, ER = external rotation. Reprinted with permission from reference 29. In conclusion, any examination of the mechanical effects of running in an exerted state is complicated by various definitions and methods of generating fatigue in runners. Studies that examine a normal training run may be in the best position to determine the typical exercise effects on lower extremity mechanics. With cross-sectional studies, the risk of injury cannot be determined; however, a trend toward mechanics associated with running injury risk has been observed for healthy athletes running in an exerted state. Injured runners, when in an exerted state, tend to adopt mechanics that may be protective against pain. Overall, there are exercise-related changes in lower extremity mechanics associated with an exerted state that could be even more pronounced when the duration or intensity of the run increases beyond what is considered typical. 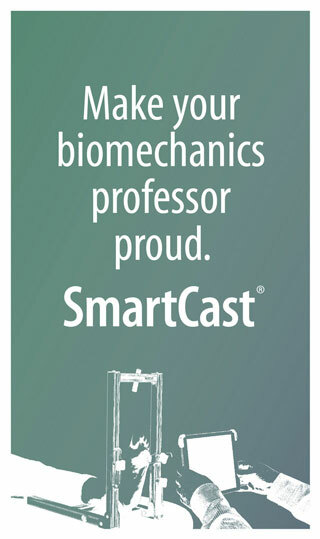 Lauren Benson, MS, is a PhD candidate and Kristian O’Connor, PhD, is associate professor and chair of the Department of Kinesiology at the University of Wisconsin-Milwaukee. Walter SD, Hart LE, McIntosh JM, Sutton JR. The Ontario cohort study of running-related injuries. Arch Intern Med 1989;149(11):2561-2564. Taunton JE, Ryan MB, Clement DB, et al. A retrospective case-control injuries analysis of 2002 running. Br J Sports Med 2002;36(2):95-101. James SL, Jones DC. Biomechanical aspects of distance running injuries. In: Cavanagh PR, ed. Biomechanics of Distance Running. Champaign, IL: Human Kinetics; 1990:249-269. Thijs Y, De Clercq D, Roosen P, Witvrouw E. Gait-related intrinsic risk factors for patellofemoral pain in novice recreational runners. Br J Sports Med 2008;42(6):466-471. Barton CJ, Munteanu SE, Menz HB, Crossley KM. The efficacy of foot orthoses in the treatment of individuals with patellofemoral pain syndrome. Sports Med 2010;40(5):377-395. Kannus P. Etiology and pathophysiology of chronic tendon disorders in sports. Scand J Med Sci Sports 1997;7(2):107-112. Nigg BM. Biomechanical aspects of running. In: Nigg BM, ed. Biomechanics of Running Shoes. Champaign, IL: Human Kinetics; 1986:1-25. Nigg BM, Bahlsen AH, Denoth J, et al. Factors influencing kinetic and kinematic variables in running. In: Nigg BM, ed. Biomechanics of Running Shoes. Champaign, IL: Human Kinetics; 1986:139-160. Hintermann B, Nigg BM. 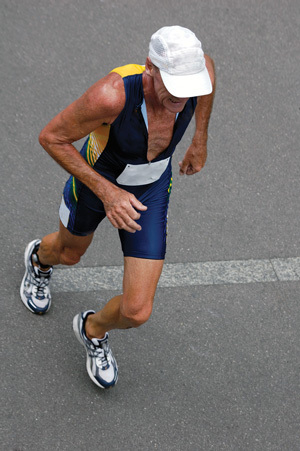 Pronation in runners – implications for injuries. Sports Med 1998;26(3):169-176. Powers CM, Ward SR, Chen YJ, et al. 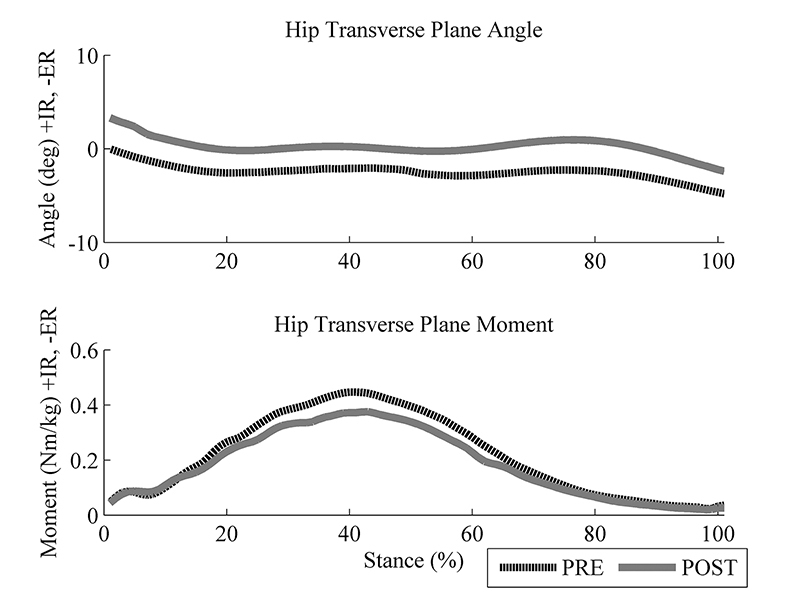 Effect of bracing on patellofemoral joint stress while ascending and descending stairs. Clin J Sport Med 2004;14(4): 206-214. Scott SH, Winter DA. Internal forces at chronic running injury sites. Med Sci Sports Exerc 1990;22(3): 357-369. Stefanyshyn DJ, Stergiou P, Lun VMY, et al. 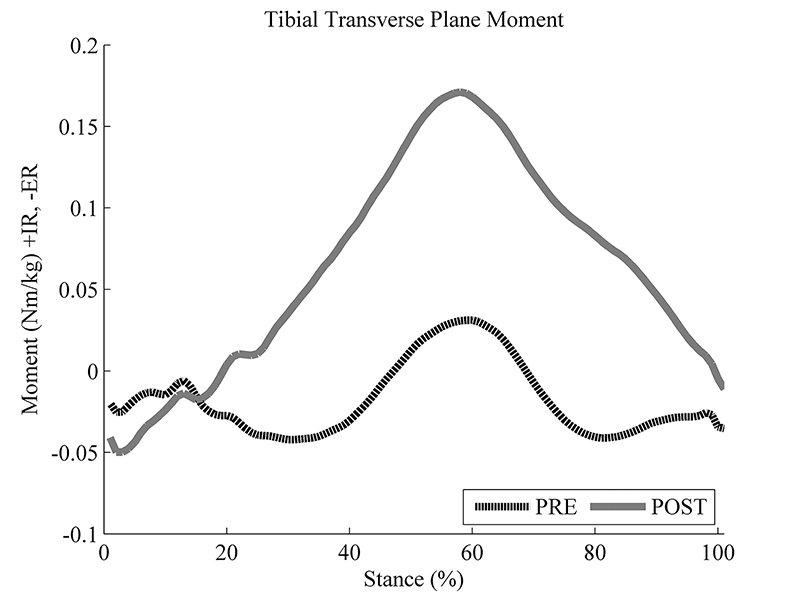 Knee angular impulse as a predictor of patellofemoral pain in runners. Am J Sports Med 2006;34(11):1844-1851. Powers CM. The influence of abnormal hip mechanics on knee injury: A biomechanical perspective. J Orthop Sports Phys Ther 2010;40(2):42-51. Boling MC, Padua DA, Marshall SW, et al. A prospective invesitgation of biomechanical risk factors for patellofemoral pain syndrome. Am J Sports Med 2009;37(11):2108-2116. Enoka RM, Stuart DG. Neurobiology of muscle fatigue. J Appl Physiol 1992;72(5):1631-1648. Gandevia SC. Spinal and supraspinal factors in human muscle fatigue. Physiol Rev 2001;81(4): 1725-1789. Weir JP, Beck TW, Cramer JT, Housh TJ. Is fatigue all in your head? A critical review of the central governor model. Br J Sports Med 2006;40(7): 573-586. Ament W, Verkerke GJ. Exercise and fatigue. Sports Med 2009;39(5): 389-422. Lucci S, Cortes N, Van Lunen B, et al. 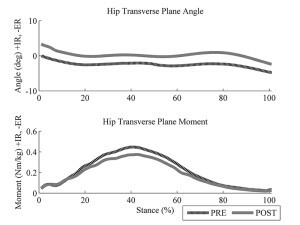 Knee and hip sagittal and transverse plane changes after two fatigue protocols. J Science Med Sport 2011;14(5): 453-459. Nummela AT, Heath KA, Paavolainen LM, et al. Fatigue during a 5-km running time trial. Int J Sports Med 2008;29(9): 738-745. Abt JP, Sell TC, Chu Y, et al. Running kinematics and shock absorption do not change after brief exhaustive running. J Strength Cond Res 2011;25(6):1479-1485. Dierks TA, Davis IS, Hamill J. The effects of running in an exerted state on lower extremity kinematics and joint timing. J Biomech 2010;43(15):2993-2998. Dierks TA, Manal KT, Hamill J, Davis IS. 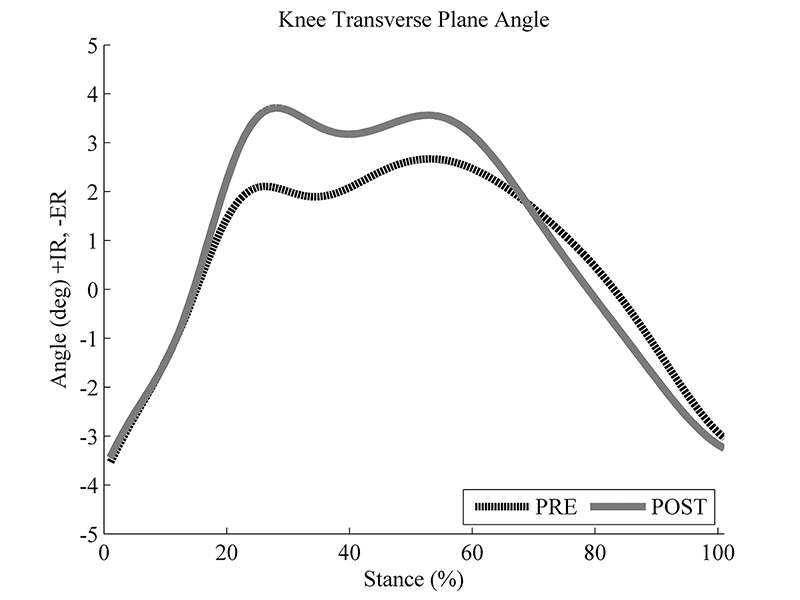 Lower extremity kinematics in runners with patellofemoral pain during a prolonged run. Med Sci Sports Exerc 2011;43(4):693-700. Bazett-Jones DM, Cobb SC, Huddleston WE, et al. Effect of patellofemoral pain on strength and mechanics after an exhaustive run. Med Sci Sports Exerc 2013;45(7):1331-1339. Benson LC, O’Connor KM. The effect of exertion on joint kinematics and kinetics during running using a waveform analysis approach. J Appl Biomech 2015;31(4):250-257. Chan-Roper M, Hunter I, Myrer JW, et al. Kinematic changes during a marathon for fast and slow runners. J Sports Sci Med 2012;11(1):77-82. Derrick TR, Dereu D, McLean SP. Impacts and kinematic adjustments during an exhaustive run. Med Sci Sports Exerc 2002;34(6):998-1002. Hardin EC, Van den Bogert AJ, Hamill J. Kinematic adaptations during running: Effects of footwear, surface, and duration. Med Sci Sports Exerc 2004;36(5)838-844. Valiant GA. Transmission and attenuation of heelstrike accelerations. In: Cavanagh PR, ed. Biomechanics of Distance Running. Champaign, IL: Human Kinetics; 1990:225-247. Derrick TR, Hamill J, Caldwell GE. Energy absorption of impacts during running at various stride lengths. Med Sci Sports Exerc 1998;30(1):128-135. Mercer JA, Bates BT, Dufek JS, Hreljac A. Characteristics of shock attenuation during fatigued running. J Sports Sci 2003;21(11):911-919. Collins MH, Pearsall DJ, Zavorsky GS, et al. Acute effects of intense interval training on running mechanics. J Sports Sci 2000;18(2):83-90. Hanley B, Smith LC, Bissas A. Kinematic variations due to changes in pace during men’s and women’s 5 km road running. Int J Sports Sci Coach 2011;6(2):243-252. Williams KR, Snow R, Agruss C. Changes in distance running kinematics with fatigue. Int J Sport Biomech 1991;7(2):138-162. Mizrahi J, Verbitsky O, Isakov E, Daily D. Effect of fatigue on leg kinematics and impact acceleration in long distance running. Human Move Sci 2000;19(2):139-151. Nicol C, Komi PV, Marconnet P. Effects of marathon fatigue on running kinematics and economy. Scan J Med Sci Sports 1991;1(4):195-204. VanGheluwe B, Madsen C. Frontal rearfoot kinematics in running prior to volitional exhaustion. J Appl Biomech 1997;13(1):66-75.